A view of Masada Armor's new bulletproof backpack. Photo courtesy of Masada Armor. Following the mass school shooting in February at Marjory Stoneman Douglas High School in Parkland, Fla., an Israeli company has stated selling bulletproof backpacks. 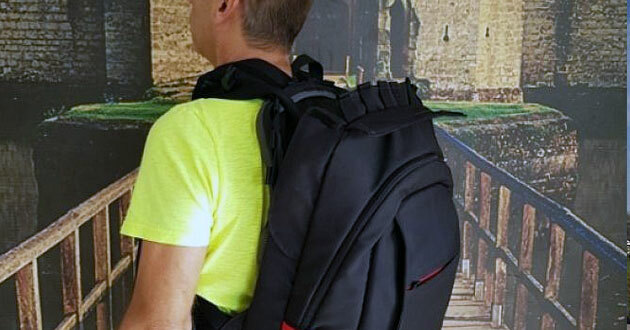 “We designed a bullet-proof backpack at the request of our distributors in the United States after the huge trauma caused by the February shooting in Florida,” Masada Armor CEO Snir Koren told AFP last month. “In two months, we have sold hundreds and are gearing up to increase production rates to 500 units per month,” he added. Koren noted that while Masada’s bags are suited for college pupils, they are too heavy for younger students. “We are developing a lighter model for their type of morphology,” said Koren. As of August, many retailers, including Home Depot, Walmart and Office Depot, have been selling bulletproof backpacks. “Bulletproof backpacks have been the one that’s been most in demand and most inquired about,” Yasir Sheikh, president of Guard Dog Security, which manufactures and sells self-defense products in stores and online told CNBC. Still, while they appeal to some customers, not all parents are running out to purchase them. Laurie Leavy, whose 15-year-old son was inside a classroom at Marjory Stoneman Douglas High School during the Feb. 14 shooting that caused the deaths of 17 students and staff, is not planning on getting one anytime soon. “I am not confident that it would save their lives in a mass shooting,” she told JNS. “Less important are that they are very expensive, and my understanding is they are very heavy before books or notebooks are even placed in them. “Although in theory I can understand why some parents would feel that sending their children to school with this type of backpack would make them safer, I do not agree,” she added, expressing skepticism that such an item would have shielded the students if they had them during the attack. For one, they would have to be wearing them for protection, when during the day many students keep them in their lockers, the backs of their chairs or even on the floor. At the end of the day, Leavy said the responsibility of protecting kids in schools should fall not on parents and students, but on law enforcement. “Schools should be given the funds to ensure security is on their campuses in the form of security guards, cameras, ID checks, etc.,” she said. After the shooting, Marjory Stoneman administrators allowed students to carry clear backpacks only, though this practice has been discontinued for the new academic year. Law-enforcement officials say what ultimately stops shootings are measures to stop the perpetrators. “The only real way to guarantee that you can stop this threat is having something that can counteract it,” said Jeremy Muraski, police captain of the Green Bay Police in Green Bay, Wis.